Our friend and student Mary Beth is the queen of fabulous pieced quilt backings. I mean fabulous. I often like the backs of her quilts as much as I like the fronts. The best part about a pieced backing is the surprise factor. It’s like a little secret to have a fun design on the back. So when it came time to make a new quilt for the pink palace that is our daughter’s room, I decided to experiment with a pieced backing. The photo above is actually the backside of the quilt. 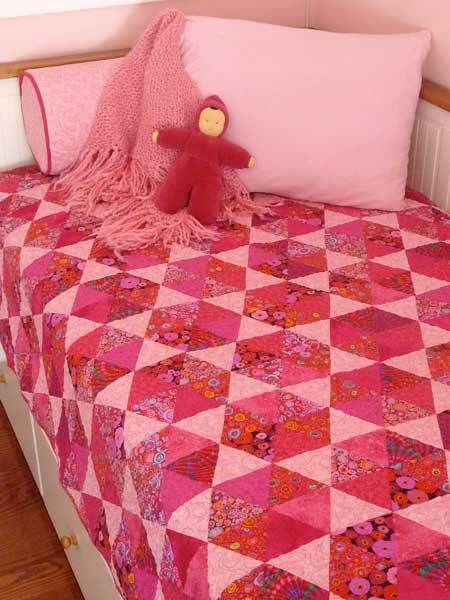 A pieced backing for a child’s bed quilt has many advantages. Kids love choices. Our daughter loves to decide which side is up and often flips it during the course of a week. If a stain won’t come out on one side, we flip it over. But the best part is getting to use up scraps from our stash. On the front of the quilt we did a contemporary version of a hexagon block to show off some of the large-scale prints our daughter had chosen. The piecing of the front was time-consuming to so I went for fast, big, chunky improvised blocks on the back. The only thing you really need to worry about with a pieced backing is the alignment when the quilt gets quilted. 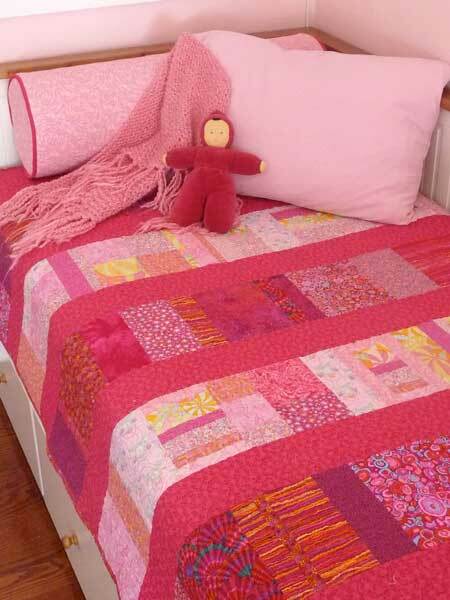 Be sure that the back and front of the quilt are square and in alignment because you don’t want one side to look fine and the other side to be out of whack. If you design the backing a little larger than the front, you’ll be able to trim it easily after the quilting, saving yourself a major headache. I love that someone finally talked about how to quilt for both sides when there is a pieced backing. I think your tip about making the backing larger and trimming away is going to be a massive time/headche-saver! Oh, and can I love the blog template! What a beautiful quilt! Both sides are just fabulously gorgeous! And your new blog looks so inspiring and beautiful too! Beautiful quilt! I love pieced backs, they make the quilt that much more interesting. What a beautiful quilt! Yes, I think fabulous backs are a fun little secret as well. Sometimes I like to just try a quilt block but don’t necessarily make a whole set of them. On my last quilt I used three of those ‘singles’ on the back and they look like featured art. Your blog is a treat. Good to see you have a blog! I look forward to being more inspired. I like your blog. I specially like the nibbles tray. And I love your daughter’s quilt. Definitely a blog worth bookmarking!